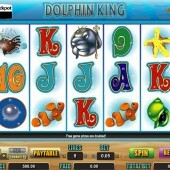 Slots based on the joys of the sea are everywhere, and Amaya's Dolphin King is a typically assured addition to this developer’s arsenal of aquatic-themed games. 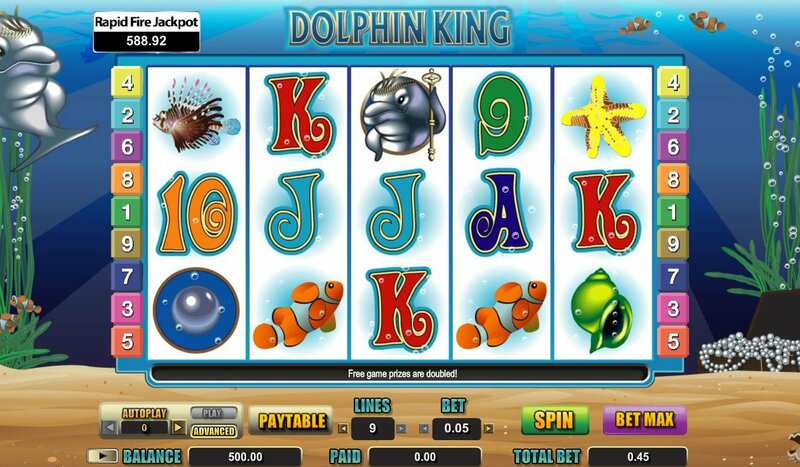 A 5-reel slot with just the 9 paylines, the reels in Dolphin King are packed with colourful cartoon characters from the ocean: a clownfish, an angel fish, a shell, a starfish, plus some 9-through-Ace symbols with psychedelic swirls. The king of the dolphins is – funnily enough – the Wild in the game and substitutes for all symbols in the game that don’t look like a dolphin king except the Scatter pearl and crown. Wild wins are doubled so it pays to hit a winning combo with him involved and five Wilds across the reels bags you a 5,000-coin jackpot. Win up to 20 Free Spins and a 2x Multiplier! Like other Amaya online slots the Wild also triggers the game’s bonus round when it appears on Reels 1 and 5 at the same time. A fairly straightforward free spins round is the play here, and 20 spins can be won when activating the feature. All prizes are doubled and the spins can be re-triggered. There's Also the Rapid Fire Jackpot! This is one of those strange online slots – simple, easy to play, and with the potential of some nice big wins. However, with only nine paylines available and a tricky bonus feature requirement, you could find yourself spending a lot of cash in your pursuit of riches. For free spins fans, however, the draw of 20 spins with a 2x multiplier may be draw enough. As you’d expect, underwater slots are everywhere online and as a result, slots fans are spoiled for choice. With a popular theme, juicy betting, and a maximum jackpot of $37,500, there's plenty to like about the sea-themed Mermaids Millions from Microgaming, while NextGen Gaming's equally lovely Dolphin Reef is a perfectly acceptable alternative for real-money players.